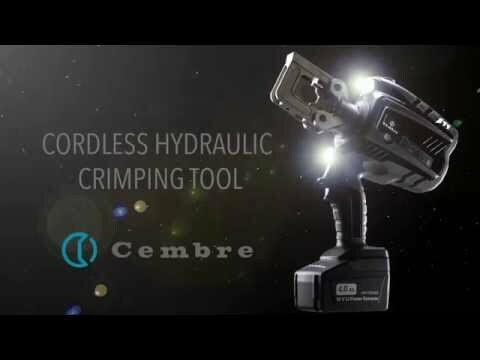 The next generation of Cembre cordless hydraulic tools represents a significantly advantageous evolution from current models. Born of the renowned B51 type crimping tool, first into the market is the 63kN B 500, suitable for a wide range of connectors up to 300 mm² using die sets common to the Cembre 50kN tooling range. New Li-Ion 18 V 4 Ah batteries offer a higher capacity than 14.4 V 3 Ah, while greater crimping speed and crimping force result from a revitalized hydraulic system with double speed action: a rapid approach of the dies to the connector then a slower, more powerful speed for crimping. A maximum pressure sensor and security valve assure greater precision and repeatability of the pressure cycle and double the provision for operator safety. Tool service required to maintain optimum condition. Designed with less weight and improved balance, B500 is easily manageable during the crimping process and, by the use of bi-component plastics, has a shell with high resistance to wear and damage. Rubber grip inserts, low noise and minimal vibration aid operator comfort while additional convenience and safety are provided by LED lighting of the working area. Crimping cycle data (upto 200,000 events) is automatically stored on a memory card for transfer to PC by USB interface. Basic tool with battery and shoulder strap. Plastic carrying case suitable for storing the tool and 14 die sets (die sets are not included) . B500-KV version also available for Power Supply Companies, provided with additional coatings to protect the operator. Further information about these products and their accessories at pdf-link below. Sign up to our newsletter and get notified about our sales.